It takes one to four days for flu symptoms to show once you've been infected with the virus. You can be contagious from the day the symptoms begin through five to 10 days after the illness starts. 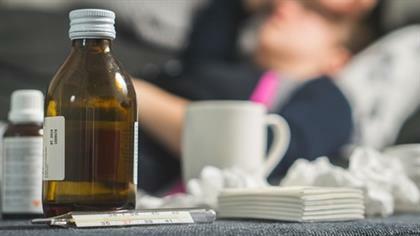 With winter fast approaching and flu season creeping up on us, it might be a good idea to refresh your memory on what you should do in order to avoid being "patient zero" in the office. Here are 10 simple tips on how to counter the flu like a professional and be a considerate co-worker. Washing your hands is the most simple and effective way to prevent yourself from spreading and catching germs that cause illnesses. According to the Global Hygiene Council, washing your hands at least six times a day with soap and water is considered the basic hygiene minimum. How long you wash your hands is also important. A quick rinse will not do, rather count slowly to 20 while vigorously rubbing your hands together – with soap, of course. Drying your hands on a clean paper towel will further help to remove germs. Washing your hands is not effective if you don't dry them properly afterwards – bacteria and viruses thrive on wet surfaces. According to a study published in the US National Library of Medicine, the transmission of bacteria is more likely to occur from wet skin than from dry skin. Eating healthily is important, regardless of whether or not you are sick. Boosting your immunity with flu-fighting foods is highly beneficial. Boost your immune system with foods rich in vitamin C, like oranges, grapefruit and lemons, as well as foods rich in beta-carotene, like pumpkin, sweet potato and butternut. Fatty fish, rich in omega-3 fatty acids is a great source of zinc. Load up on meat, poultry and eggs, too, to keep your immune system strong to combat the flu. Over-the-counter medications such as effervescent immune boosters are great as they are designed to strengthen the immune system and protect your body against colds and flu. Remember that antibiotics are useless against a cold, as colds are caused by viruses. However, if you have the flu, an antiviral might help – this works best when taken as early as possible. Hand sanitiser is so convenient – you can keep a bottle in your pocket, purse, car or at your desk at work. Using an alcohol-based sanitiser is more effective in reducing the spread of rotavirus, adenovirus and rhinovirus than medicated and non-medicated hand soaps, according to studies done by the Centers for Disease Control and Prevention. Scientists have discovered that it only takes a single sneeze from a person with the flu to spread germs around an entire room. With this information, not covering your nose and mouth during a sneeze should be a punishable offence. If you do not have tissues handy, use your elbow instead of your hands. This is because you don't touch things with your elbow like you do with your hands. If you have to use your hands, clean them with hand sanitiser. Areas used by your co-workers such as doorknobs and cafeteria tables are a breeding ground for germs. According to a study conducted by Dr Charles Gerba, professor of microbiology at the University of Arizona, the dirtiest place in your office is the break room. So if you know you're not feeling great or just trying to avoid getting sick during flu season, try and avoid these areas or clean your hands thoroughly before and after using them. If you are suffering from a cold, staying hydrated helps you to recuperate. Drink as much liquid as possible; your urine should be a pale transparent yellow if you're doing it properly. Try water with lemon and decaffeinated tea with honey. Stay away from alcoholic drinks as these will dehydrate you and intensify your flu symptoms. Take time off from work to recover at home, especially if you're coughing and sneezing constantly, as those are the fastest way to spread germs. Staying at home will not only speed up your recovery by resting, but you will also be saving your co-workers from your germs. If you cannot afford to stay home and rest, try to isolate yourself from contact with other people as much as possible. If you can, work in an office by yourself or find a desk as far away as possible from your colleagues. If you do have to leave your quarantine, make sure you wash your hands with water and soap or hand sanitiser before and after you've touched anything, including your face. Read here on why your place of work could be making you sick.